Former head of Nintendo of America Tatsumi Kimishima will take over from the late Satoru Iwata. The passing of Nintendo president Satoru Iwata was one of the saddest events in this gaming year, with respects and tributes coming in from all corners of the gaming universe. Iwata left a hole, not just in our hearts, but in Nintendo's corporate structure, as the company has been operating without an official president since Iwata's passing. 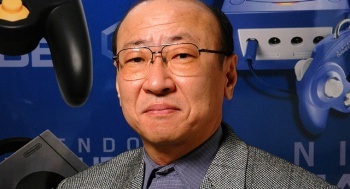 Today, Nintendo has announced its new president: former head of Nintendo of America Tatsumi Kimishima. Kimishima previously served as President of The PokÃ©mon Company, before moving to the US and serving as President of Nintendo America from 2001-2006, when he was replaced by the ever-charismatic Reggie Fils-Aime. He has been Managing Director of Nintendo Co. Ltd (Nintendo's parent company) since 2013. While Kimishima is certainly a long-time Nintendo employee who has proven his worth for the company, he comes from an entirely business background, getting his start as a banker - unlike Iwata, who cut his teeth as an actual game programmer. In other news, two high-profile Nintendo employees have been given new titles. Shigeru Miyamoto and Genyo Takeda have respectively been awarded the title of Creative Fellow and Technology Fellow, with the official personnel document defining a Fellow as "An individualselected from among the Representative Directors who has advanced knowledge and extensive experience, and holds the role of providing advice and guidance regarding organizational operations in a specialized area." So there are big changes in store at Nintendo - let's just hope they are for the best. Although, maybe it will bring about the change people wanted to see from Nintendo, following the money to the endless stream of CoD and Madden NFL sequels. Only time will tell. I'm mostly curious about the fate of the Nintendo Directs. Iwata was the face of those. And Kimishima doesn't exactly look the type for the kinds of antics we have seen from Iwata. You can see the axiety on his face at the thought of having to follow in the footsteps of the most huggable games company president ever. Though I have to add an addendum: I continue to boycott financially supporting Nintendo due to their inconsistent attitude towards the internet and archaic virtual console platforms that's technically bordering on monopolization. Just hope they address them, want to try out some games on their platforms and yet they force me to avoid them. I hope part of the job interview process was bowing and saying "Please Understand". He better pull that part off. Because when something happens, I'll be judging his performance. Good luck to Kimishima, hope he does as good a job as Iwata did. No small shoes to fill! He doesn't look very huggable. His history, despite the financial background, looks alright, and his experience of American markets might be a factor in the decision. He doesn't look like a nintendo direct kinda guy though. An American influence over Nintendo might just be what the company needs to improve its profitability. There are so many non-ported games under their brand that can be turned around into a quick buck. Then again, this guy has a job I would never envy. Even in death Satoru casts a great shadow. Not the kind of replacement I was hoping for and not a position that's easy to fill. I'll give the guy the benefit of the doubt though. Who knows what direction he could take Nintendo in? He most certainly doesn't. He looks more like a manager at McDonalds. But as long as he does his job right. They still have Miyamoto and Rubberhead Reggie for the stage. I hope the Reggmeister has been practicing his please understand! On the bright side, he won't need a translator at events. But seriously good luck to him and Nintendo. I'm mildly worried. Iwata coming from the ground floor of programming is what made him such a great boss. He cared about games as entertainment and art and was generally a fun and wonderful guy. This guy is a businessman. I'm not really all that confident in my own worry that his taking-the-throne of the company might lead to more business-y practices. Now granted, I don't think Miyamoto or Takeda are gonna let anyone (especially the awful shareholders) ruin all the great stuff and policies Iwata did/put into place. But I'm still kinda scared. Man, that guy couldn't look more like the stereotypical japanese business man if he tried. I'm glad to see that he's compensating for his lack of gaming knowledge by promoting up some key people as advisers. That said, is this the guy that made it so we in the states had to write petitions to get some of the games on the wii or was that Reggie? It had to have been Reggie, chronologically speaking. Given his back round, I would say he is very qualified. Being President of Nintendo of America and the Pokemon Company are two very big positions at Nintendo. Iwata had the amazing developer/business hybrid back round, but Kimishima's been there for a long time too, and he probably knows the culture at Nintendo well. I don't envy the lengths he will have to go to prove himself a good successor both in the business, and personal aspects. Iwata was so beloved, it will be like the poor soul that has to succeed Reggie. Yes and no. He was president of NoA and the Pokemon Company during the Gamecube era but has been the CEO of NoA after Reggie took over. With that being said, don't expect too much change between Iwata and him. He has been involved with Nintendo since Yamaguchi and has been in the higher ups since Iwata took President. Given Iwata's complete control of Nintendo both top and bottom, he wouldn't have stayed if he had a completely different vision. To all of those who are worried. Keep in mind that Nintendo's president before Iwata hated video games and was 100% businessman yet the NES-Gamecube eras were under his name. Plus, this guy has been along since the Gamecube and knows Nintendo. Also, for the Nintendo Directs, they have already been branching out to their respective public leaders for a while now. Japan already has a Direct guy, Europe has Shibata, and America has the dual combo of Reggie/Bill. They can easily fill the shoes of Iwata for Directs. OT: I'm still amused around the Techonology Fellow and Creative Fellow titles. I don't see this ending well for the consumer. Something tells me that neither Miyamoto, nor Takeda, actually wanted the responsibility (Miyamoto has actually said such things in the past, he just wants to make games). So what is the next logical step? Bring in somebody respected, with a long Nintendo history, and a background in senior management - I don't think there were any other options over Kimishima. With Miyamoto and Takeda both getting new titles I feel like they'll be doing a bulk of the 'company direction' work and Kimishima will be a more traditional President/CEO.